Obituary for Betty Ann (Foxwell) Jones | Thomas Funeral Home P.A. Betty Ann Jones of Auburn, Alabama, formerly of Fishing Creek, passed away suddenly, yet peacefully on August 14, 2018 at her home. She moved to Alabama in March 2015 to be cared for by her daughter, Diane Jones Chavis and husband, Harold. Betty was born October 9, 1940 and was the daughter of the late Sewell and Jeanette Newcomb Foxwell. She grew up in Church Creek and attended school in that area. On July 3, 1957, she married Ronnie Jones. They were married over 50 years when he passed away January 10, 2008. She devoted her life caring for her husband and family. Hard work was a way of life for her, yet she never complained. Her greatest joy was doing for others. She was always ready to volunteer to help her church and community and loved her many friends. 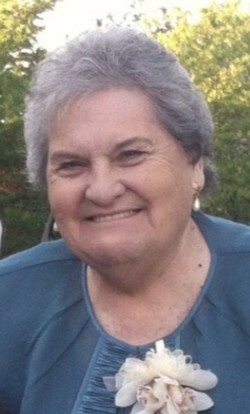 Betty was a member of White Haven United Methodist Church. After moving to Alabama she wanted to regain her independence and later moved in at Oak Park Senior Living. "It's not home, but it's really good" was her motto. While living at Oak Park she enjoyed swimming, bingo, dining and outings with her new friends. She attended Pepperell Baptist Church. She is survived by her dear brother Bill Foxwell (Reida) of Church Creek, grandchildren, Ashley Mitchell (Clay) of Georgia, Michelle Davis (Marshall) of Virginia, Rhonda Wright (Gordy) of Salisbury and Chris Chavis (Kim) of Alabama and great grandchildren Caden, Colson and Cambrie Mitchell, Clara Davis, Cortlin, Cameron and Collier Chavis, aunts Mildred Newcomb Quidas and Jeanette "Bootsie" Newcomb, Marie Newcomb Hughes and son in law, Gary Adams, along with many nieces, nephews and cousins. A celebration of life will be held on Thursday, August 23, 2018 at 7 pm at Thomas Funeral Home, P.A. in Cambridge with Rev. Robert L. Kirkley officiating. Family will receive friends from 6 to 7 pm. In lieu of flowers, donations can be made in Betty's memory to Hoopers Island Volunteer Fire Company, c/o Rosemary Dean, PO Box 125, Fishing Creek, MD 21634, White Haven United Methodist Church, c/o Jeanne Ewell, 5134 Paw Paw Point Road, Cambridge, MD 21613 or Pepperell Baptist Church, 2702 Second Avenue, Opelika, AL 36801.